Gold a profitable investment again in 2012 - Outlook for 2013? Home » Can Your Dollar Do This? Can Your Dollar Do This? Gold closes 2012 marking 12 straight years of ascending value – What’s the outlook for 2013? What does it take to have a bull run for gold to be continuously called a bull run? December 2012 was a touch-and-go month for gold, as it ended the month about $50 lower than it started. Some may be led to think that the value of the metal had tanked, at least judging from recent sensationalist headlines calling it a risk asset rather than the traditional hedge against inflation that it has served for centuries. A number of pundits have gone so far as to show the numbers behind why gold prices should be marked to oil, not the dollar. Others have begun to realize that gold has not tanked because more than Americans buy and trade the metal. Still others claim that like fiat money, gold’s value is a group hallucination. But no one can deny one simple fact: Since 2001 – and including in 2012 – the price of gold has climbed each year over the previous. Yes, the metal is currently range-bound as 2013 swings into view, but far from collapsing, the yellow metal seems to be preparing itself for another shot at $1,800. Top brokerages have been calling for highs over $2,000 in 2013, all of which cite a variety of factors that support a continued rise in the price of gold. Most of them have precious little to do with the fiscal cliff. At the turn of the century, the global fiscal landscape was far rosier, with the U.S. enjoying budget surpluses. Gold entered 2001 under $300. Eight years of ponzi-scheme-like book balancing in the U.S. and exceptionally lackluster monitoring of global banking systems resulted in steady flight into the safe harbor of gold. Now in the midst of this century’s second decade, what can we expect? Quantitative easing has become the standardized way of central banks around the world to stave off a repeat global economic collapse. But anyone with any sense will attest that this multinational fascination with monetary printing results in nothing better than coffers full of IOUs. Countries that excused themselves from the shenanigans of gambling-addicted bankers, or were not considered significant enough to manipulate, are now thriving economically. South Korea and Iceland stand out as examples, with Brazil not too far behind. What we are looking at is a flattening of wages globally, and thus, the shrinking of major economies. In such a scenario, gold will likely shine like a beacon. Whether or not gold maintains its ascending value throughout 2013 remains to be seen. Contracting first world economies will create a need to store wealth in ways that are not readily fungible in order to protect value. Everything from art to collectibles – anything other than paper money – become safer harbors of wealth. Gold is universally accepted as one of the world’s best containers of value. Forecasters can sometimes get themselves worked up in a froth by focusing on too tight a window of time; they can’t see the forest for the bark. Gold is epic, it’s legendary, it’s inspirational; its worth transcends weekly market reports. Thus, it is paramount to understand gold as both cultural effect and economic barometer. The 12-year bull run is no fluke or accident. Be certain to take long views of market change ever so often in order to enjoy the scenery. We do. Learn more: Why gold and silver in 2013 and beyond? 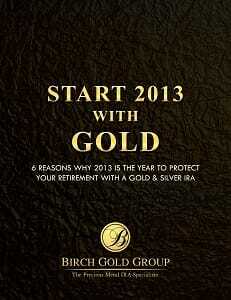 Just in time for the start of the new year, Birch Gold has published a limited-time, exclusive report that details why physical gold and silver can make strong investments in 2013 and beyond. Available only for a limited time, Start 2013 with Gold highlights six factors that likely will contribute to a further increase in value of precious metals in the years to come.